The Parker all aluminum leaning bench, from Wishbone Site Furnishings, is a result of requests from customers. 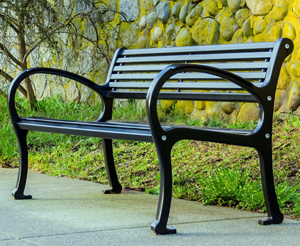 The value of leaning benches is that they provide a perfect solution for those who don’t want or need to sit down but need a place to temporarily rest. They also provide an alternative to standing in locations where benches are not feasible. As with many of our other products, we were up for the challenge. Our design criteria was to achieve these goals: maximize the materials we currently have in stock (to keep our costs in line), complement our very popular Parker family series, and lastly make it comfortable and stylish. We think we nailed it! Wishbone Site Furnishings is a proud Canadian manufacturer raising the bar on innovation and design while maintaining practicality and functionality in site furnishings since 1995. We build exceptional products, provide incomparable service, and deliver outstanding value. Our products delight customers and users alike, not just when they are new, but even after many years of active service. Longevity and ease of maintenance are as important to our designs as style and uniqueness. As passionate as we are about form and function, we believe great products do not need to come at the expense of the environment. All Wishbone products are made from recycled or sustainable materials, creating beautiful solutions that work better and last longer than alternatives.